Food Network star Sunny Anderson shared her top tips for making the ultimate turkey gravy. The Thanksgiving turkey has been cooked to perfection, but when it comes down to making a sauce to go with it, a lot of people just aren't sure how to make a gravy that isn't full of pesky, floury lumps. However, it's actually surprisingly easy — with the right method. 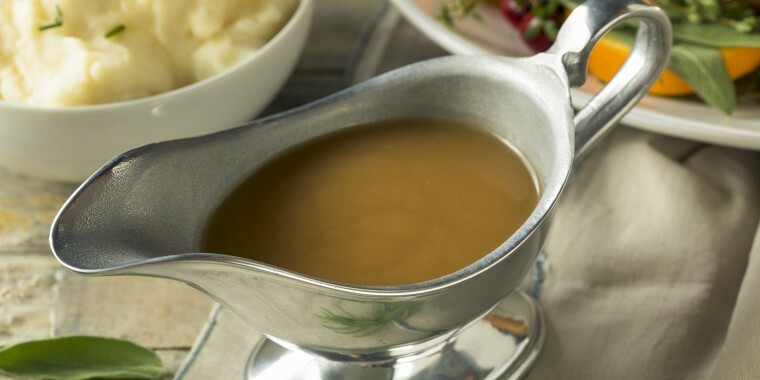 The secret to making a lump-free gravy is to combine the turkey's pan juices with a roux, a thickener that's used to make sauces. A roux is made with a 1-1 ratio of flour to fat, like butter, for example. Gravy can often be lumpy when that the flour is not evenly distributed in the liquid. Combining the flour with a fat coats it and gives it time to do its job, which is to slowly incorporate into the pan juices to make the gravy thick and smooth, instead of huddling into a clump. One tablespoon of flour and equal parts fat can thicken about 1½ to 2 cups of gravy, depending on how thick or thin you like it. 1. Deglaze the turkey pan. 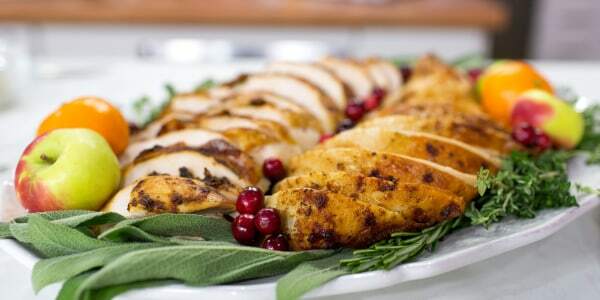 Remove the cooked turkey from the roasting pan. Place the roasting pan on the stove over medium-high heat. To deglaze the pan, add 4 cups of chicken broth or wine to the pan drippings in the pan. Bring the mixture to a simmer, and stir often to scrape up the brown bits. Pour the reduced pan juices into a measuring cup with a spout. Spoon off the fat that has settled on the top of the pan juices, and reserve it for the next step. The key to making a roux is to start off by using equal parts fat and flour. For the fat, use butter if the oil from the top of the pan juices isn't available. In a medium-heavy saucepan, melt 4 tablespoons of butter over medium heat. Alternatively, heat 4 tablespoons of oil from the top of the pan juices. Using a whisk or wooden spoon, vigorously whisk or stir 4 tablespoons of flour into the melted butter or the oil, until the flour is fully incorporated. Cook the roux, whisking continuously, until the flour's raw scent and flavor are gone. 3. Combine the deglazed pan juices and the roux. Slowly begin adding the deglazed pan juices to the roux, still whisking vigorously until fully incorporated. Simmer until the gravy thickens slightly. Season the gravy to taste with salt and pepper. If something went awry and there are any lumps, pour the gravy through a sieve to remove any undesirable elements. 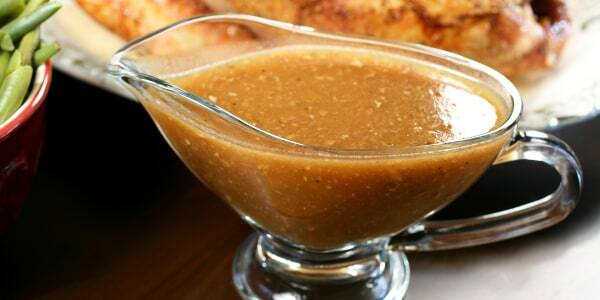 Now, just carve the turkey and serve it with the delicious gravy! Don't want to make a roux? Food writer and cookbook author Melissa Clark shared a special method for making canned gravy taste like the real deal. "You can doctor up canned gravy and make it taste homemade by adding the turkey drippings," Clark told TODAY Food. "Just put the turkey roasting pan on the heat, scrape up the browned bits — you can add a little water, wine or broth if they are really sticking — and bring to a simmer. Then pour [the mixture] into the prepared gravy. It really adds to the flavor."